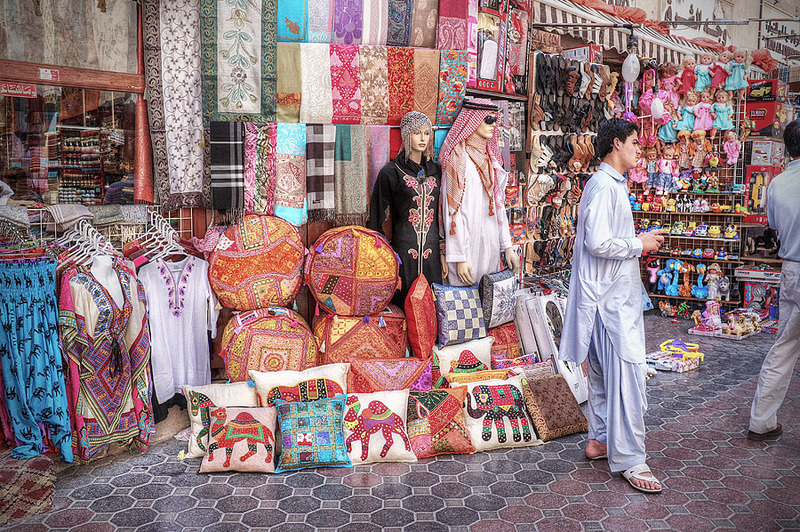 You never know what you will see when you take a walk along the busy traditional market areas in Dubai! There are so many bargains to chose from and such a lot of variety, that you can spend a whole day in this place. From brightly coloured clothes, to the latest and trendiest fashions; footwear of all kinds, silk scarves, traditional arabic costumes, elegant embroidered cushions to decorate your house with, colourful po’ofs to laze around on…you just have to think of it, and keep looking…you will find it in this market. This place is a bustle of activity in the evenings and weekends. People from all walks of life come here to this market to look for the best bargains available. So, we were rather surprised to see this shop relatively empty, and the salesperson outside it, making it almost look like he was there waiting for some customers to come and visit his store. To anyone planning a visit to this market, a few words of advice…go during the winter months, its a whole lot cooler and much more enjoyable. And remember to take a camera along, because like we mentioned earlier, you never know what you will come across. This entry was posted in Street Photography and tagged bargains, colour, Dubai, fashion, footwear, market, people, sales, shopping, traditional, UAE on August 29, 2013 by pkphotography. Jaipur, the capital of India’s largest state is a city filled with forts and monuments, by virtue of its Rajput Rulers. One of the largest tourist centers in India, this city (also known as the “Pink City”) allows you to experience the culture, heritage and grandeur of days gone by; and there is no better place in Jaipur to experience this than the “Chowki Dhani” village. Half an hour of driving through the crowded streets and you find yourself at the entrance to the Chowki Dhani Tourist Village. As soon as you enter the doors, you pass into another place and time. Brightly painted haveli’s, colourful costumes and rich colours, traditional music and dance forms, pottery and handicraft, handprinted block printing, rides on colourful camels, puppet shows in the most basic form, traditional musicians and dancers; – all this followed by a sumptous Rajasthani Thali – makes your trip to Rajasthan truly unforgettable. But thats not all; after you have dined; (I must warn you here…it involves sitting cross-legged on the floor, on large cushions, which is uncomfortable for those not used to it, but its when you have to get up that you really have a problem), you take a stroll acroos the open sands, and you will come across many traditional coir strung beds. Stretch out on these crude but extremely comfortable platforms, enjoy the gentle warm breeze as it travels over the hot desert sands, and gaze up at a sky full of stars. Its another world ! One can easliy spend a whole evening in this place without being able to fully participate and take in all the excitement and activity that it has to offer. You generally leave wishing this magical evening does not have to end ! 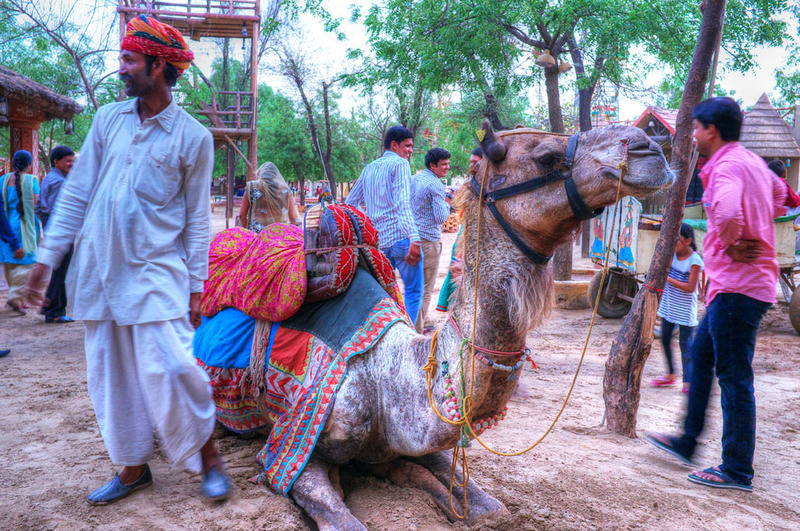 This entry was posted in Travel and Leisure and tagged Camels, Chowki Dhani, colour, India, Jaipur, tourism, travel on August 28, 2013 by pkphotography.